After my wine mishap last year which resulted in a new laptop, I have been ever more careful when it comes to backing up my data and more importantly my very precious images. Unfortunately I did have a slight loss of images for which I only had myself to blame. When people tell you to back up – LISTEN! I used to work for Memorex when I lived in London and recall the launch of the new 2GB USB drive. It was tiny and cost an absolute fortune, yet at the time, it was portable and that was what made it so attractive. Nowadays you can purchase external hard drives with a capacity of over 1 Terabyte that are just as portable as USB drives. Working with such a small device as the Seagate Backup Plus external hard drive is bizarre as my previous 500GB hard drive was the size of a house brick and required power through a plug socket. Seagate offer Backup Plus external hard drives in 500GB, 750GB and 1 Terabyte external hard drives with the option to choose, black, silver, red or blue casing. I was kindly sent the blue 500GB Backup Plus hard drive for the purpose of this review and have to say it is quite charming to look at. Much more so than my old, boring, brick-like hard drive! Simply using the USB cable included, hook it up to your computer and feel free in the knowledge that all the data you wish to save will be transferred over and kept safe within the hard casing of the drive. As it is so easy to use and transport there really is no need for me to not run a regular back up and with my first back up of images and music only totalling 5GB, I am rest assured that with a total of 1% of the 500GB space used, it will be a while until I can even attempt using the hard drive at full capacity. So, what makes this external hard drive different to all those on the market? 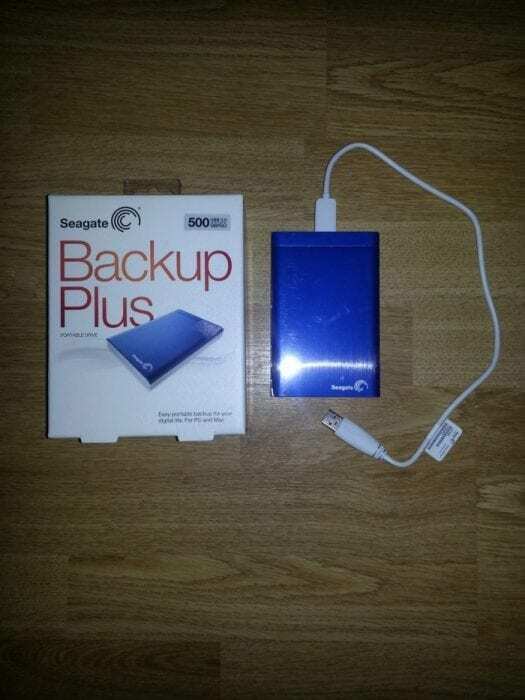 The fact it is a Backup Plus drive! The drive connects with your computer to showcase a dashboard on screen which enables you to schedule future back up’s or make them automatic. You are even able to save the images you post on social media sites such as Facebook and Flickr. Seagate recently completed a survey and concluded that 50% of the UK population use Facebook – I myself am included in that number but never did I realise that my images could still be lost, even from saving them on the site. You can even share your images and videos from the hard drive to your chosen social network with a simple click! I tend to forget old images saved on hard drives so this makes it easier to upload them to Facebook so that I can enjoy them again. The added reassurance that the handy little hard drive will backup all my images make the price of £58.20 (from Amazon, also available at other selected retailers). The sleek design is very in keeping with how much technology is progressing on a daily basis and I like the fact the drive is available in different colours. This fact actually makes the Seagate Backup Plus external hard drive a fantastic gift idea for Christmas – with most homes now owning a computer of some sort it is definitely wise to pass the message of backing up, alongside good tidings!